We have long had plans for an Opera Gala to celebrate our 150th anniversary but at the very moment that we were due to send out invitations Sally Silver, who is organising the music for us, was taken seriously ill. After extensive tests tragically she was diagnosed with brain cancer and the prognosis is not good.. We seriously considered cancelling the Gala but Sally has been determined to go ahead. She is continuing to sing as well as ever as she awaits treatment. She would be so encouraged if the event were a sell-out, so I hope you are still able to come, and will encourage your friends and family to come too. Tea, coffee and cakes will be served in the interval to help cover our expenses and there will be a retiring collection to cover the musicians’ expenses. Any surplus will go to Brain Tumour Research. The tradition is that people dress up for Opera Galas. Don’t worry if you can’t but if you can that would be fabulous! Better still, wear a hat – the symbol of Brain Tumour research. 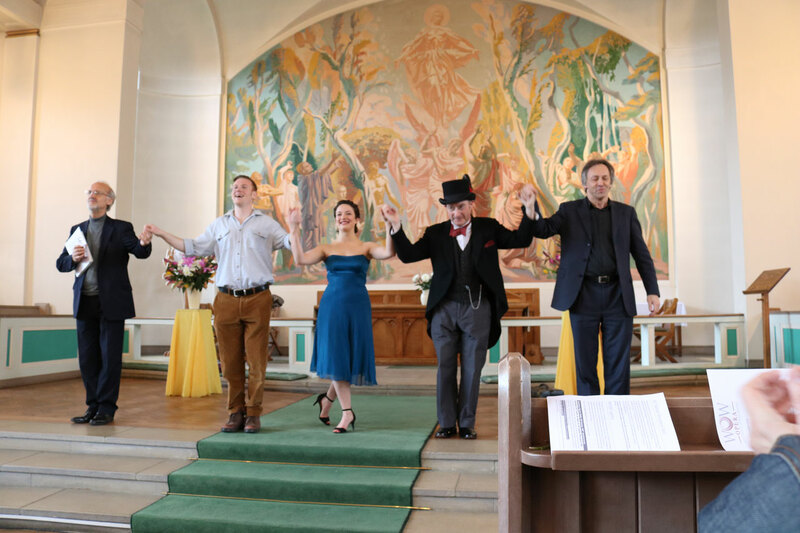 The concert will include operatic highlights such as: Rigoletto quartet (Verdi); Lakmé Flower Duet (Delibes); and The Pearl Fishers duet (Bizet), and features an international line up of soloists, led by Jeremy Silver at the piano, including bass-baritone Tony Baker, mezzo soprano Carolyn Dobbin, soprano Carole Irvine, baritone Alejandro Lopez Montoya, tenor Dominic Natoli and Sally Silver herself. 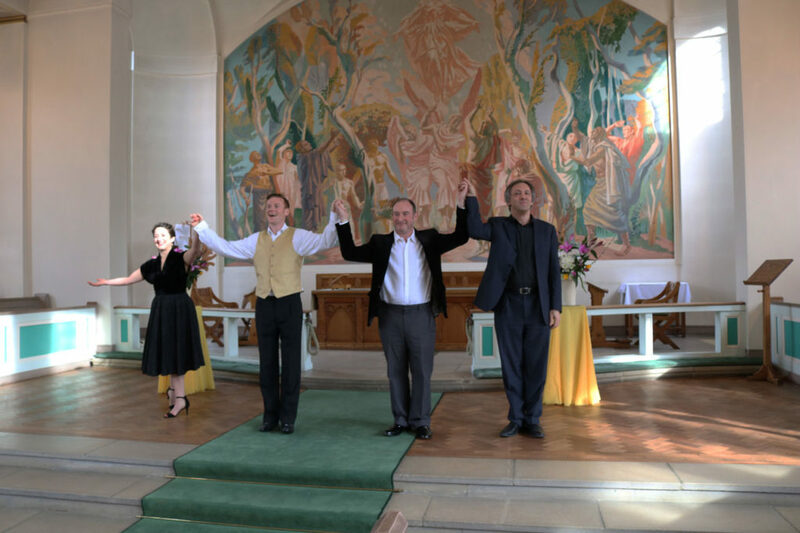 Entrance to the concert is free, and tickets aren’t essential, but if you would like to reserve a seat you can do so at https://billetto.co.uk/en/e/opera-gala-to-celebrate-150-years-of-all-saints-shooters-hill-tickets-199612 There was a standing ovation at Woolwich Opera Works’ last marvellous concert at All Saints, Incanto: The Magic of Naples, and this one is bound to be very popular, so I’d recommend booking a ticket beforehand. In 1867, when a zealous Diocesan Missioner came searching for a place in which to set up the banner of Jesus Christ he found lightly wooded country where now we have our hilly streets and closely packed houses. A large meadow extended from what is now Eglinton Hill to Plum Lane and a country lane led up from Herbert Road to Shrewsbury Lane with a stile where now we have the junction of Genesta Road and Eglinton Hill. The area was sprinkled with a few cottage houses, but there were no houses at all on what is now called Ripon Road. According to David Lloyd Bathe’s “Steeped in History” the country lane leading up to Shrewsbury Lane was Mayplace Lane. The diocesan missioner, the Rev. William Nesbit McGuiness, set up a church in a large tent at the top of Eglinton Hill, where the fire station flats now stand. He attracted a congregation of 200 people to hear him preach. In 1868 an iron building was erected lower down the hill which was used as a church until the Rev. McGuiness was given grants to buy the plot of land between Cantwell and Herbert roads and build a day school there. This was completed in 1872. The Rev. McGuiness then took on the task of raising money to build a church next to the school. For several year he wrote, by hand, an average of 10,000 letters a year asking for money for the church. He received about £9000 in donations from all over Britain, as well as from Germany, Italy, Austria and Switzerland. The first part of the church, the nave, was consecrated in 1875 and the final part of the building, the tower consecrated on 11th April 1881. A sketch of the Rev. 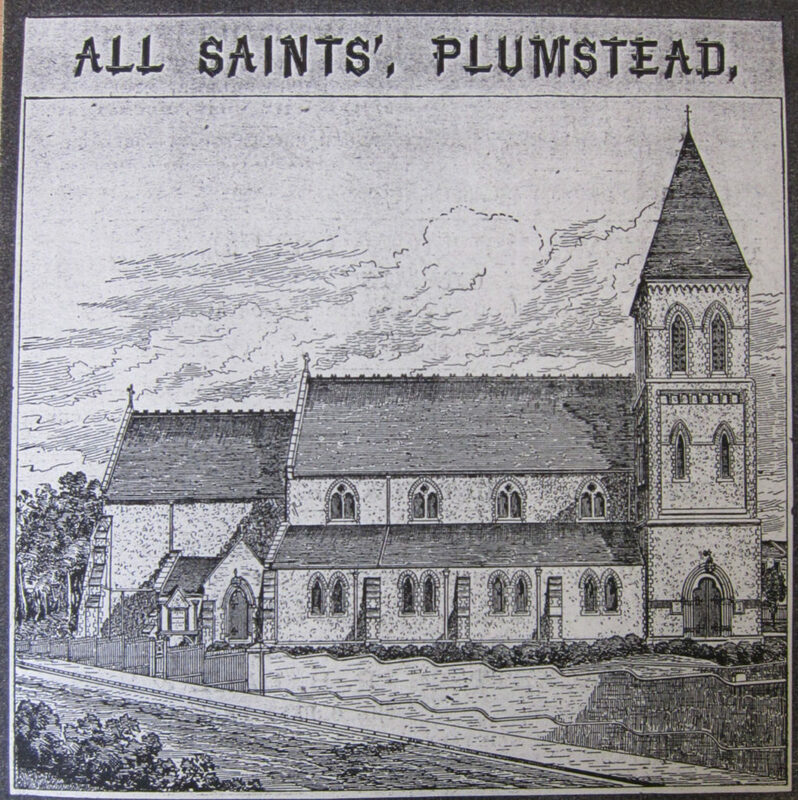 McGuiness’ All Saints Church from the Greenwich Heritage Centre is shown below, and there is a coloured photo taken from “Steeped in History” further down. 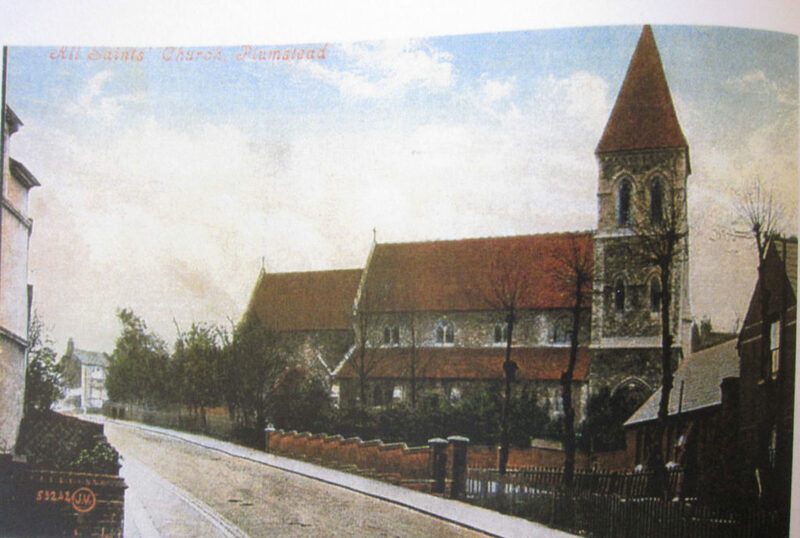 It was located higher up Ripon Road than the current church, as can be seen in the bomb damage map. During the war the church was hit a number of times, but was repaired by the vicar, the Rev W.H.G. Gilbert and his team of volunteers. It was finally destroyed on 30th August 1944. 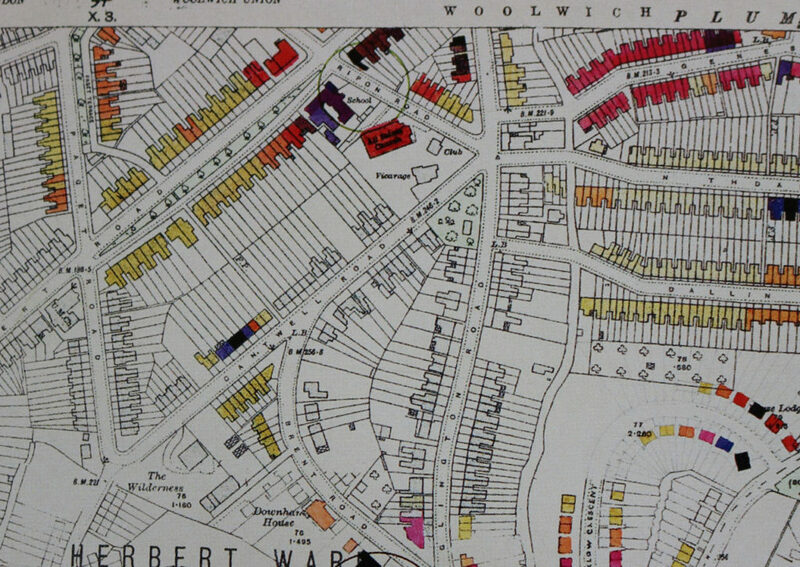 The snippet from the LCC bomb damage map below shows the church near the top and the day school to its North. Heavy damage is shown in darker colours, with black indicating “total Destruction”, purple “damaged beyond repair” and red “seriously damaged – doubtful if repairable”. The circle indicates a V2 rocket hit which, “Steeped in History” says was what finally destroyed the old All Saints Church. 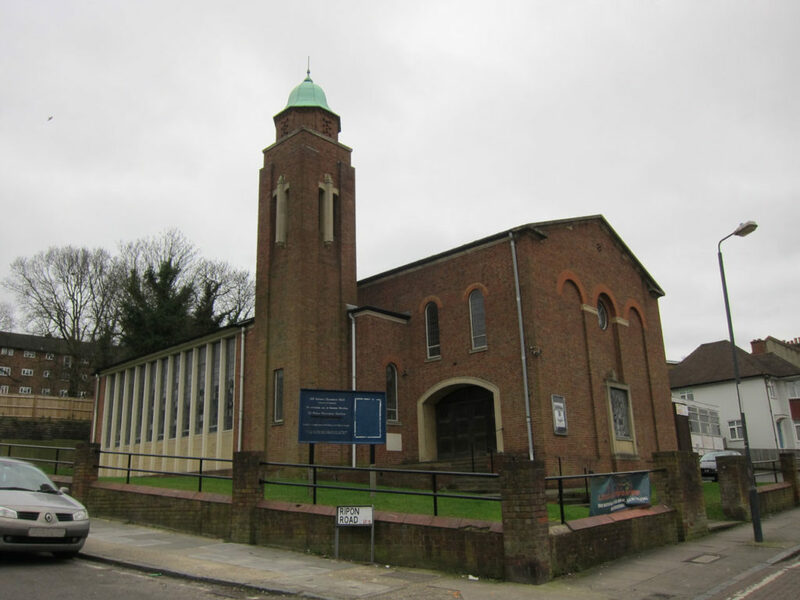 The All Saints congregation kept going with services held in temporary buildings such as an iron building at the junction between Eglinton Hill and Cantwell Road for 4 years until 1948 and then in the church hall which the civil authorities had been using during the war. Over the years the congregation donated £5000 to the rebuilding fund which augmented the war damage allocation. The foundation stone for the new church was laid on 18th February 1956 and the consecration took place on 6th July 1957, almost 60 years ago – a second anniversary to be celebrated. The architectural style of the building is derived from the Greek Classic of the early 19th century, modified and adapted to suit modern materials and requirements. What little detail there is of mouldings and enrichments retains that precision of line and care for proportion which earned for this style the title of “The Reign of Elegance”. The East wall is covered with a large painting by Mr. Hans Feibusch depicting the Ascension scene with Our Lord in the act of going up into Heaven. Below him are two angel figures speaking to the assembled disciples, who are in postures that suggest wonder, adoration and worship. This work is painted direct upon the plaster wall, and in form and colour makes a magnificent end to the church. The colouring of the rest of the interior has been most carefully considered so as to enhance, and not conflict, with the riot of colour on the East wall. Hans’ mural will provide the backdrop to WOW’s singers in what I’m sure will be another excellent concert on Sunday. Don’t forget to wear a hat.